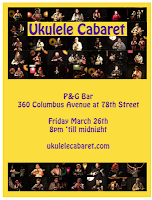 The Ukulele Cabaret inaugurates its new home on the Upper West Side at the famous P&G bar, which features a separate performance space. Come join the fun! Thanks to Sonic Uke for hosting. The Fleas will be in the 9 pm set! 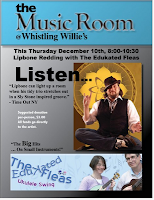 The Fleas are pleased to be back at the Music Room, sharing the bill with Lipbone Redding once again. This is sure to be another fun evening! We'll be playing a 40-minute set at 8pm -- come join us for a drink or dinner. The place was packed last time, reservations recommended! Yes, this is the poster from last time, but you get the idea.